Income Tax Return efiling- How to do it online? – Complete step by step guide for Salaried Employees. July 31 st is the tentative last date for Income Tax return filing for all tax payers in India. It is mandatory for all income tax assesses, including the salaried employees to file Income Tax (IT) returns within the stipulated time. Income Tax returns can be filed either online or offline depending on your convenience. Return filing through the online method is also known as e filing. 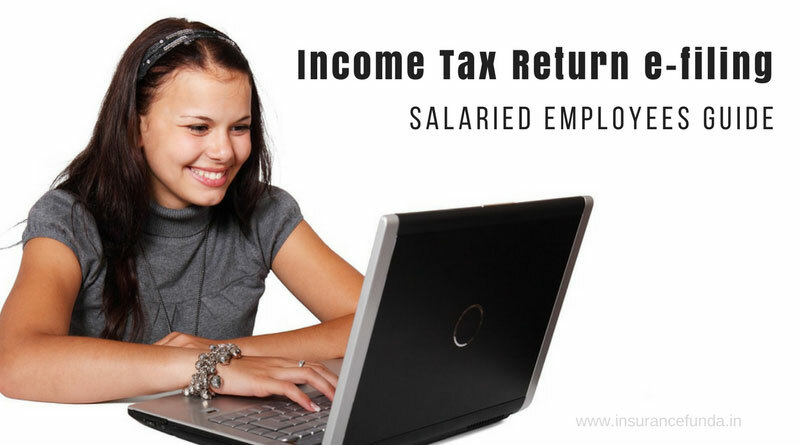 Income Tax department has simplified the return filing process to such an extent that online Income tax return filing (e filing) can be done successfully by all with minimum technical knowledge about it. Follow this step by step guide on e filing of income tax returns and complete the process successfully. It is always advisable to cross check your tax liability before starting the process of e filing. You can use any reliable income tax calculator to check your tax liability. The Income tax calculator provided here at InsuranceFunda can be used for this purpose. Before starting the e filing process please ensure that following documents are ready with you. As per the latest instruction from the Income Tax department, Your PAN card has to be linked with your Aadhar card. If you have not done the linking process earlier, please do that immediately, to enable successful e filing process. Read a detailed article on how to link your Aadhar Card and PAN for more information. Income tax return e-filing – Step 3 – Determine the ITR form for you. This step which is often ignored by many in the process of return filing, is really important. Make sure that all your income channels are properly taken care off. Please go through the quick guide on the ITR forms given below. If you are coming under the bracket of ITR -1 then you are having two options for filing your income tax returns. Method 1 – Online – E – filing of returns using online mode. Even though both these methods are valid, I highly recommend using the Online mode or e filing method. The advantage of online filing is that the process is quick and can be completed in few minutes. Various steps involved in income tax return e-filing are demonstrated in the info-gram provided below. The best method which I recommend for e filing is by using a software utility provided by Income tax department which is available at free of cost to all. We can use either Java utility of the excel utility depending on your choice. Click here to download excel or Java e filing utility form Income Tax web site. Even though, both of these utilities work perfectly, I recommend you to use Java utility. The reason is that Java utility is more powerful and will help you to complete the process in fewer steps. Please check the illustration provided above to understand more on the steps involved. You can download Java Runtime Environment (JRE) for free from here. Once you have installed JRE you can download the Java utility and open it. Pre – filling of common details is the first step you should do after opening the utility. This is highly recommended as most of the important details which you need to fill manually otherwise will get automatically filled in this process. Java utility can pre-fill the details from either your PAN card or from previous return filed and the best part of it is that the entire process is automated. If you are using the excel utility, pre – filling can be done using the xml file created for the previous year, if available with you. Once you have completed the process of pre-filling, enter the remaining unfilled data using the statements available with you as mentioned in the step 2. Validation of the data entered by you to the utility is an important step to be performed for Java as well as excel utility. Validation buttons provided on each page will help you to track errors. It will also notify you in case you left some mandatory fields unfilled. Make sure to do validation on all pages where data is filled. Once you are sure that all the relevant data is entered and validation has been done successfully, you can submit the returns. As explained in the diagram, for excel utility, you will have to create an ‘xml file’ using ‘CREATE XML’ button provided in the utility. The xml file thus created can be uploaded to income tax e-filing portal. If you are using Java utility you can directly submit the returns using the ‘SUBMIT’ button. Income tax return e-filing – Step 9 – Submitting ITR – V form. On successful completion of submission of income tax returns, you will receive a single sheet form bearing the name ITR-V. If you are using a digital signature to sign the uploaded form you will not get an ITR V form, as the efiling process will be completed even without that. You need to sign ITR V in BLUE INK and send it to the address mentioned in it by ordinary post or speed post. Note # E filing of IT return can be done directly at the Income Tax Portal without using any utility also. But I highly recommend you to download the utility and use it to complete e filing. The reason is that chances for accidental errors can be minimised and you can take your own time before uploading. Read more: Online Income Tax calculator 2017-18.